Great conferences share a handful of similarities. They cover timely, engaging and important topics. Their speakers manage to be inspiring and thought-provoking without inciting either controversy or boredom. Exhibits are easy to maneuver and their displays showcase items, products and services vastly different from those encountered in regular life, and if they offer food — and they should — it is always tasty. Other considerations, like location, special events and weather, can certainly be brought to bear, but for Kentuckians like ourselves, only two other concerns actually have merit: Will bourbon be served, and how good is that bourbon? AutoVision 2016, you were definitely a great conference. 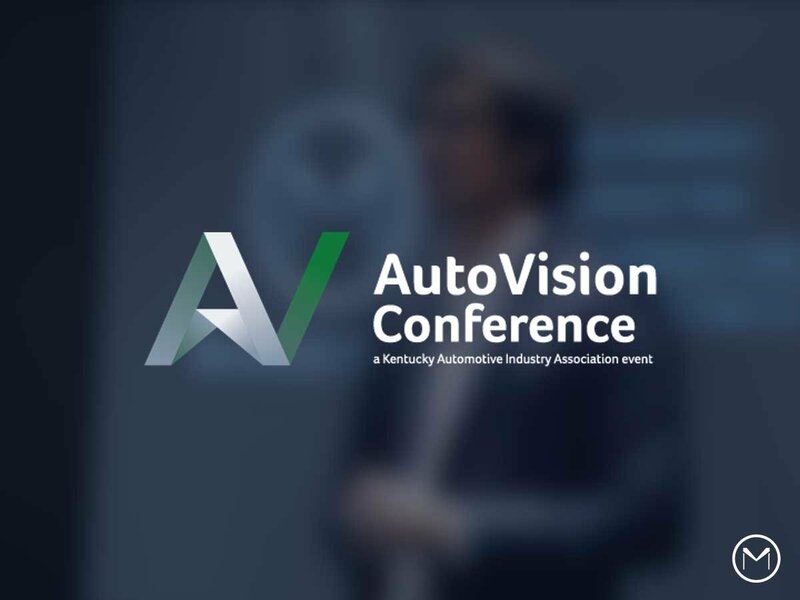 The premier event put on each year by the Kentucky Automotive Industry Association (KAIA), the AutoVision Conference seeks to strengthen and support Kentucky’s vital automotive sector. This year’s event, held in Lexington at the Lexington Center, lived up to and exceeded its goals as wide-ranging issues, including workforce development, autonomous vehicles, government and trade policy, disruptive tech, 3D printing, diversity and IIoT were all discussed. Being that the automotive sector is hands-down the most important industry in the state of Kentucky — besting bourbon, tobacco, coal, horses and tourism in economic impact — it’s fair to say that attendees’ expectations (ours included) heading into the conference were high. How could it be otherwise? Automotive manufacturers and suppliers directly employ over 90,000 Kentuckians. Automotive payroll to those workers is well over $6 billion each and every year. Auto workers in the Commonwealth also produce some of America’s — and the world’s — favorite cars: the Toyota Camry, the Lexus ES 350, the Ford F-Series Super Duty truck and every single Corvette. Kentucky is an automotive state, and AutoVision is our prom. Every big and small player in the industry was in attendance. And it was great. From the mini Hot Browns we washed down with Woodford Reserve to the keynote address delivered by Wil James, President of Toyota Motor Manufacturing in Kentucky, AutoVision delivered again and again in a multitude of ways. Here’s a closer look at just some of the conference’s many stellar highlights. To say that Kentucky Governor Matt Bevin is a fan of the Kentucky automotive industry is an understatement of massive proportions. His welcome address officially kicked off the conference, and he took ample time to showcase his zeal, pride and competitive spirit throughout the address. The governor sang the industry’s praises and talked about specific ways he and the legislature would improve automakers’ ability to do business. From reducing red tape to committing to workforce development, the governor was steadfast in our state’s ability to give OEMs and other industry heavyweights what they needed to be profitable. He also discussed how the state would fund a national center at the University of Louisville to research efficiency in the automotive industry and sustainable transportation. His commitment to automaking in the Commonwealth was inspiring, and his goals for Kentucky’s economic future were best summed up in the following statement, “Kentucky can be the engineering and manufacturing hub of excellence in North America.” We think so, too governor, and we’re doing everything we can to make sure we achieve it. Local Motors is a tech company that has netted contracts with organizations as wide-ranging as GE, Airbus and DARPA. While known mostly for their work 3D printing electric cars — and their ability to showcase that work in impressive ways — the company is more than just an additive manufacturer looking to disrupt the automotive industry (although they’re definitely doing that). Specialists in co-creating, the Local Motors approach to making and manufacturing is ultra-local, democratic and totally open to anyone who wants to join them in their endeavors to remake how we make the world in which we all live. When Gregory Haye, the GM of Knoxville’s Local Motors microfactory, addressed the conference, he took great pains to underscore his company’s values and vision. In many ways, Local Motors’ values and vision overlap, which is why whenever Haye spoke about designing and 3D printing cars and other transportation solutions, he also spoke about environmental sustainability, end-user design participation, distributed manufacturing and fair wages. He said a lot that was worth repeating, but our favorite quote was this one: “We are loyal to local and won’t stop until supply and demand have the same hometown.” The thing we’re most looking forward to in Local Motors’ future? The Olli — a self-driving, electric trolley that seats up to 12 people and is powered by IBM Watson’s Internet of Things for Automotive. Local Motors is banking on Olli’s ability to change public and private transport, especially in environments like college campuses. In an age increasingly automated and looking to bypass the human being in order to maximize productivity and profits, James’ emphasis on the importance of people was refreshing. Whether guiding and overseeing suppliers of windshield glass or CNC machined parts or teaching a worker to hear a flaw, the quality of a worker’s training was viewed as being in direct proportion to the quality of her work. That a business with those values and that level of expertise employs people on factory floors right here in the Bluegrass made us incredibly proud to work with the auto industry in Kentucky. It’s a way of doing business that pays off handsomely, too. Mr. James, perhaps an executive in Japan will one day say the same thing about the plant and people you oversee in Georgetown. 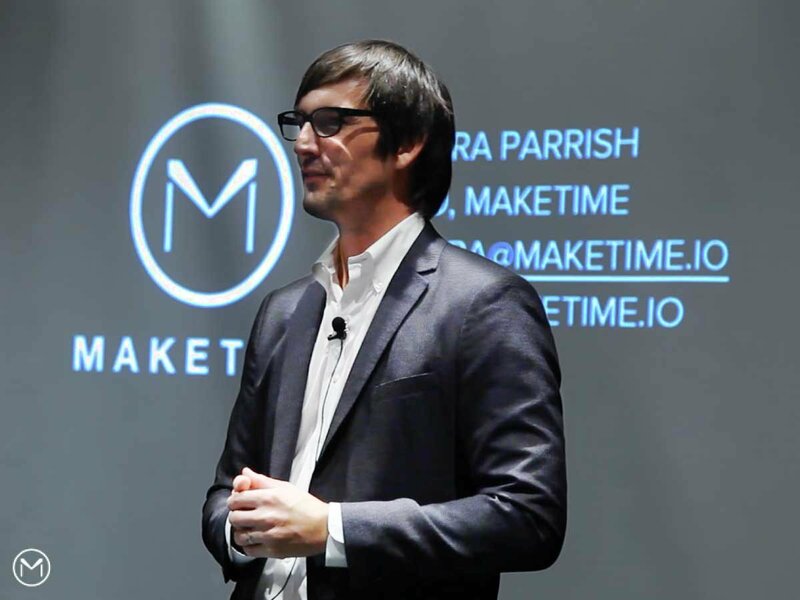 It should come as no surprise, but our absolute favorite part of the conference was getting to hear our intrepid CEO lay out his vision of how MakeTime is set to radically transform U.S. manufacturing. While it’s a vision we all know by heart, it’s one that still sounds prescient. Here are a few of its dominant themes. First, the future of manufacturing anything, including CNC machined parts, is distributed. Not because it’s trendy or possible — but because it’s necessary. The marketplace is shifting rapidly. More and more, customers want access to a greater variety of products. To answer that demand and compete for it, manufacturers need to produce more in smaller batches, along faster timelines, with a greater ability to offer customization. That marketplace shift means any supply chain that isn’t nimble, flexible and just-in-time is a threat to a business’ bottom line. Delays and disruptions can literally spell the end of a company’s market share as impatient consumers gravitate toward what’s available now. From a Fortune 500 company to a mom and pop shop, nothing but a quick and agile approach to procurement will do, and it just so happens there’s a company right here in Kentucky that can almost instantly transform any supply chain into one that’s quick and agile. Drura’s case is made especially vivid at an automotive conference. Disruptive tech has already transformed a lot of industries — taxis, banking and finance, hospitality, communication — but automaking is still mostly dominated by big players operating more or less by the old rules. Yes, there are companies like Tesla and Local Motors, but their share of the market is still so small it’s barely noticed. Drura makes a good case that all that’s about to change. The convergence of the Internet of Things, big data and computational manufacturing is about to transform everything. What that transformation looks like when the dust settles is anybody’s guess, but unless automakers and manufacturers embrace it, they stand to miss out on a revolution as significant as any in the last 150 years. It was clear he meant it, too. At MakeTime, our hyper-focus on online CNC machining production keeps our awareness of the world of 3D printing and its accomplishments on a backburner. We know it’s there, and we think it’s fabulous, but we’ve got our hands, minds and efforts more than full with manufacturing online CNC machined parts. 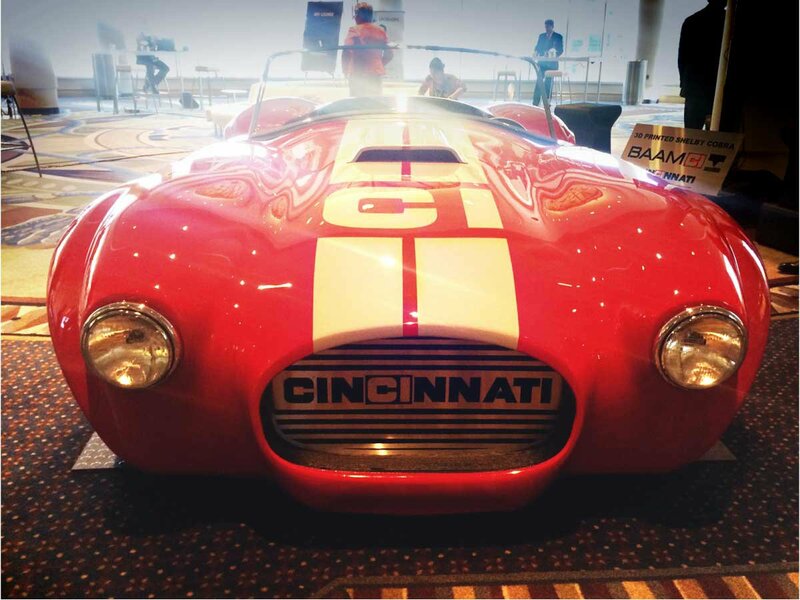 Well, the 3D-printed car made by Cincinnati Incorporated landed smack-dab in the middle of our consciousness. Set up just outside the AutoVision 2016 exhibit hall so no one could go in or out without pausing to admire it, the car — a shiny, red Shelby Cobra — greatly resembled a 1950s roadster. It was like an Archie comic come to life. Of course, such nostalgia-inducing design belies the car’s more sci-fi origins. No one in the 1950s could have predicted a 3D-printed anything, let alone a car. While it turns out that this particular car can’t be driven, its very presence as a display shows that additive manufacturing is poised to keep impacting the industry. The KAIA clearly cares about AutoVision attendees, because the food at the conference was plentiful and delicious. While we would happily discuss it all if we were running a food blog, seeing as we’re Kentuckians in the CNC machining business, we’ll just dive deep into the mini Hot Browns served during the cocktail hour that closed the conference. To those not steeped in Kentucky tradition and lore, a Hot Brown is a decadent open-faced sandwich invented in Louisville at the Brown Hotel at the height of the Roaring Twenties. The Brown Hotel was an incredibly popular Louisville spot, routinely entertaining more than 1,200 guests a night for dinner and dancing. After hours of doing the Charleston, the Turkey Trot and the Black Bottom, the guests were in dire need of a meal to revive their flagging bodies and spirits for further dancing, so they would make their way to the hotel’s restaurant for a plate of ham and eggs. The chef at the time, Fred Schmidt, wanted to provide his guests with more than just a pile of traditional calories. He wanted to create a dish befitting the glamour of the hotel and its guests. His solution to combining glamour and calories was the Hot Brown, and people in Kentucky have been eating it ever since. Imagine fresh, sliced white bread topped with succulent slices of turkey, covered with Mornay sauce and parmesan cheese and placed under a broiler until it’s hot, bubbling and delicious. Throw a few pieces of crisp bacon and some fresh, sliced tomato on top, and you’ve got yourself a Hot Brown. Eat a whole one, and you’ll be fueled to continue dancing the night away or fueled to enter a food coma. While the excellent mini Hot Browns at AutoVision 2016 didn’t come with bacon or tomato, they were still a perfect companion to bourbon and conversation. AutoVision 2016 was a helpful reminder that thanks to the efforts of the state’s automakers, workers and the KAIA, the Kentucky automotive industry appears to be hearty enough to withstand any storms brewing on the horizon. As Kentuckians and people who work in manufacturing, that’s good news we don’t take for granted. Find out more about how MakeTime can help you meet your CNC machining production needs.